Dual service is A.O. Smith’s new and completely unique way of utilizing our high efficiency direct gas fired water heater to provide heating and hot water to a building with maximum contribution from the sun and HE water heater. In one tank, and with one control system, the water heater will control the energy input from solar and the energy output to heating while still providing the domestic hot water. 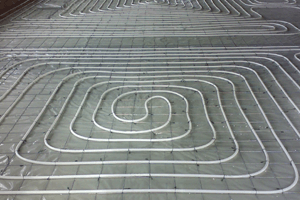 Dual service is especially suited to installations with a large hot water demand and a relatively low central heating demand. Buildings insulated to high levels in order to satisfy Part L will benefit from dual service. As the hot water demand is a larger portion of the total energy requirement it is logical to use the water heater to provide the heating – as traditionally a boiler was also used to provide hot water. One of the advantages of applying Dual service on a BFC Cyclone, SGE or SGS is that both needs can be met with one installation. Also, the installation uses one flue gas discharge connection, one water and one gas connection. Finally the entire installation is managed from one control panel. Do you already have a BFC, SGE or SGS and you want to connect a Dual service module? Please contact A.O. Smith. Should you need support in selecting the correct module, please contact A.O. Smith.